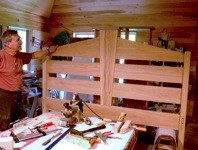 I have made many different types of beds over the years, but this is my favorite - Carol Bass designed this from an impressionistic view of country fences. The first one we built together was for a client of hers on Swans Island off Mt. Desert Island here in Maine. 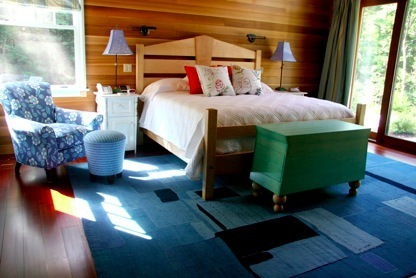 It was constructed of solid hickory, to blend into the hickory flooring specified for the bedrooms of this island cottage - so we named it the Swans Island Bed. We had the best time delivering this bed to our client on the island - the ferry ride from Bass Harbor, through Blue Hill Bay, by Julia Child’s Maine cottage in Bernard and out to Swans - what a trip! This Bed is not for the faint of heart. It is solid, well built, has the iconic look of something really well conceived and made in Maine. It is put together with 7 inch bedbolts, has a sturdy, if not indestructible foundation which will not rack or wobble under any circumstances! Built in Queen or King sizes. Other sizes available on request. Wood species of cherry, curly or bird’s-eye maple, walnut, hickory and butternut available.